President Vladimir Putin is the bee’s knees. There’s noone to beat him, electionwise. But when it comes to feeding Russians the genuine article, Putin’s promise is a honey trap. Naturally, we are talking only of the business of Russian beekeeping, honey production and trade. Eighteen months after Putin listened to a Kemerovo region beekeeper complain that adulterated and counterfeit honey products imported from abroad were driving genuine Russian honey out of the market, the president said he would order the government to investigate. The study which followed early this year has confirmed the economic damage adulteration is doing to the Russian bee business, and proposed to combat it with tighter regulations and more comprehensive testing. But the packers and retailers of fake honey have successfully lobbied Putin to sit on his hands. Nothing has happened – except that Russian production of honey is now falling. .
On April 25, 2016, Putin hosted a regional forum of the All-Russian People’s Front (ONF) in the Kemerovo region of Siberia. The Kremlin has published the transcript here (pictured below). Putin was asked by a local beekeeper, Dmitry Nikolaev, if he would investigate counterfeiting and adulteration, and protect the domestic producers of honey. Left: the most powerful beekeeper in Russian politics, Yury Luzhkov, ousted as Mayor of Moscow in September 2010 by then-President Dmitry Medvedev. 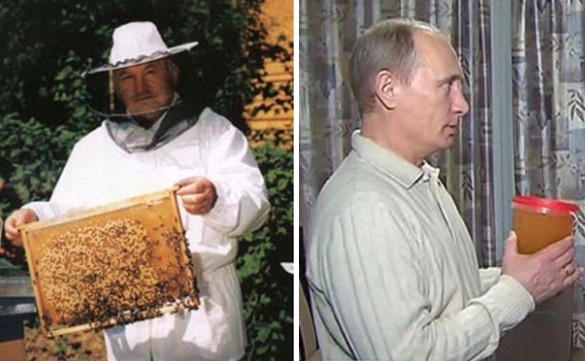 Right: Then-Prime Minister Putin holding a pot of honey, a gift from a beekeeper in Kirov region in February 2011. Putin’s script was partly right, partly wrong, but his precision in response to a professional beekeeper was misplaced. Russian production of honey for the domestic market is sizeable; export volume is minuscule. 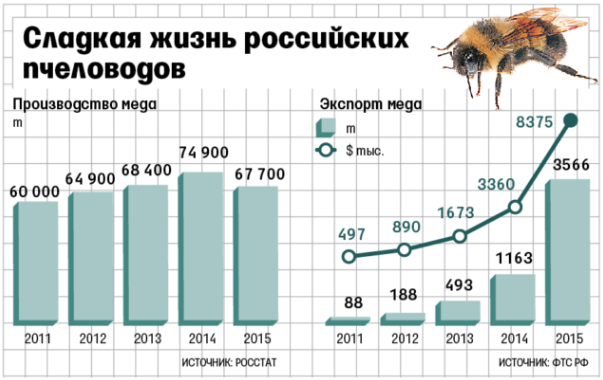 Even if it met EU standards – and Russian beekeepers acknowledge it is costly for them to do so – the domestic impact of adulteration would remain large and costly. .
KEY: The top line is production in thousand tonnes; the bottom line, imports in thousand tonnes. In parallel, the import statistics for honey show there has been the sharp fall which the president read out. In 2010 the import volume was about 6,000 tonnes. In 2014 it was down to 2,400 tonnes; in 2016, 630 tonnes. The Ukraine and China, which dominated the import trade until 2014, have disappeared, at least from the official statistics. The reason for the declines in exports and imports has been the falling price of honey in the domestic market, which has reduced the profitability of the trade – Chinese imports, along with other sources. Moreover, as the professional beekeepers add discreetly, the official government figures on which Putin was relying are not accurate, especially not for Chinese imports, whose volume is hidden in honey branded and sold as if it were domestically produced. That’s the cheap stuff Nikolaev was warning Putin about. A study followed by the new state agency, Russian Quality System (Roskachestvo). It has reported that among the honey and honey products consumed by Russians in the retail market there is contamination by antibiotics, especially prevalent in Chinese honey, and adulteration to increase weight and reduce cost. Roskachestvo recommended that the Ministry of Agriculture and the food regulator Rosselkhoznadzor (RSN) add into the technical regulations requirements to keep out antibiotics, and certify that Russian honey exports will also be free of antibiotics. This year, industry sources report the global price of honey is reviving, and that production and trade are picking up again. It is also quite clear, Russian beekeepers say, what must be done. This is because the adulteration problems are worldwide. Apimondia, the world organization of beekeepers, estimates that about two-thirds of the honey in trade is adulterated or fake, and that several large trading companies are responsible for most of the honey blended, packaged and shipped for wholesale. They are powerful enough, according to Apimodia, to corrupt, deter or block effective enforcement of product standards. In the US, anti-dumping sanctions were introduced against Chinese honey in 2001. A new review of these measures commenced this month in Washington. The US press reports that despite efforts by the US Department of Agriculture and the Food and Drug Administration to tighten honey product regulations, labelling and grading, there is no enforcement. The technology of adulteration is also advancing faster than the testing methods in use. It is expensive to equip laboratories to detect honey counterfeiting. In Russia, Butov (pictured, below left) says there is reluctance on the part of the government authorities to introduce tighter standards, and to improve enforcement. He won’t say which “powerful government officials” are refusing to implement new standards. Left: honey production in tonnes; right: exports in tonnes (columns), value in US dollars (line). Last year, according to the latest figures from Rosstat, domestic production revived but export volume fell almost by half. The latter was caused by a sharp fall in global honey prices. The larger-volume, more established exporters in the market were able to beat the Russian competition because of their higher reputation for their guarantees against antibiotics and other adulterants. China took the lion’s share of the Russian honey exports, trailed by Kazakhstan, Sweden, and the US. In the global market 16 countries account for 85% of the honey trade — Australia, Argentina, Bulgaria, Brazil, Hungary, Vietnam, India, Canada, China, Cuba, Mexico, New Zealand, El Salvador, Turkey, Uruguay and Chile. Russian honey exports represent less than 1% of domestic production, but from Argentina and Vietnam the figure is above 80%; Canada exports 30% of its honey; Australia and China, about 25%. According to Butov, it is difficult to name the top five companies according to their volume of production. “It’s because they aren’t genuine producers. 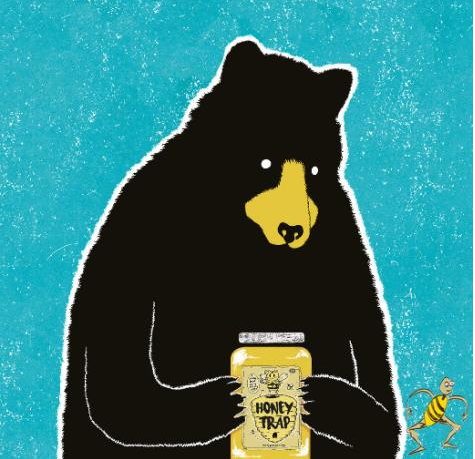 What they do is to buy honey from private producers, blend and pack it, ignoring the standards for genuine honey.” Butov says the top Russian honey-producing regions are Bashkiria (Bashkortostan), Altai, Krasnodar, Primorsky Krai, and Volgograd. In recent years, honey production in the Altai region has increased sharply. It was about one thousand tonnes in 2003. In 2015 it was 4,800 tonnes, and continuing to rise. Letf: Governor of Altai Alexander Karlin visits hives at Medovik Altaya (“Honey Pie of Altai”); see the company website. Right: Znatny, one of the branded natural honies in Medovik Altaya’s product line. The top five Russian exporters of Russian honey are Arkon (Primorsky Krai); Medovik Altaya; Asiatek (Primorsky Krai); Forest Products Company (Khabarovsk); and Tseyamusy (Jewish Autonomous Region). The leading Russian importer of honey is Mistral Trading of Moscow. Butov said the priority for his organization is “to mobilize the private honey-farmers into cooperatives, and combine with them to produce genuine honey under our own label.” For a list of Russian domestic honey producers on the market at the moment, click to open. According to Nelyubov, the annual production of around 70,000 tonnes in Russia is “not a large number for a such a big country, and Russian honey is only 1% of the world’s honey production. The average volume of consumption of honey in Russia is about 500 grams per person per year. Almost nothing.” By comparison, the annual consumption level in Germany and Japan is between 2 and 3 kilograms. For more details, open the beekeepers’ website and click to read the internet forum. Mistral Trading is the leading importer of honey in the Russian market, according to the official figures, but the company declines to respond to questions about the trade in adulterated honey. 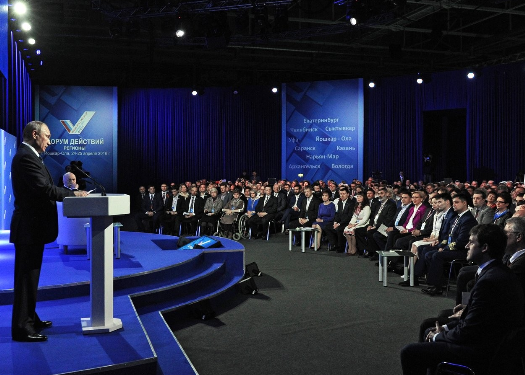 At the Kremlin the President’s spokesman was asked to respond to the view of the beekeepers that since Putin’s speech in Kemerovo, the government is siding with the fake producers and retailers, and refusing to improve or enforce the regulations, as Putin had promised. What is the President’s intention towards protecting the Russian honey industry? the spokesman was asked. He replied that the question should be asked at Rosselkhoznadzor. The RSN spokesman Alexei Alexeyenko did not reply to the questions. The Ministry of Agriculture was also asked to comment on its measures for standardizing honey. It had not replied by press time.